The Student Government Association is a multi-purpose organization that can grant funding to students for conferences or programming, promote other student organization’s programs, as well as host University-wide events. Take a moment to explore our website to learn more information about our executive board, senators, and the different ways that SGA can benefit you, the student. Please feel free to contact us with any questions or concerns, or come by our office in Union 344 to meet with us in person. 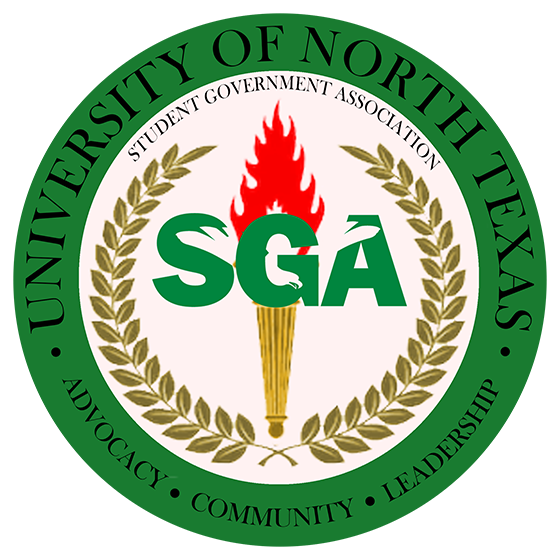 The Student Government Association is the official voice of the undergraduate student body at the University of North Texas. As an organization, we are committed to making each student’s opinions and concerns heard in the administration. The Student Government Association is comprised of an Executive Branch, Student Senate, Supreme Court, and the Intern Program. Together, these factions work with students across the University and administration to make our campus better for everyone. Our Seal represents the Undergraduate Students at the University of North Texas. They are what encompasses the Student Government Association. This seal encapsulates the ideas, morals, and values to which SGA stands for. The Outer Circle - Just as there is no true ending to our development, this outer circle represents the never ending development of students. The Inner Circle - The inner circle represents the passion and fire that the undergraduate students represent throughout their Mean Green journey. The Torch and the Flame - The Torch represents SGA itself, which supports and nourishes the flame, which is the fiery passion with which the students of UNT will change the world around them. The Dots - The dots around the rim of the Seal represent the Faculty, Staff, Administration, and Students, who must all come together to make this dream continue to be a reality. Student Government Association being within the Circle - Student Government Association is surrounded by the circle of dedicated, passionate, and inspiring student leaders, who protect and defend SGA and the ideals and morals it represents. The Wreath - The wreath represents the everlasting bond between the University of North Texas and its students, through corridor of years. This is included in our seal to show that no matter what happens to our students, whether it be good or bad, we as a UNT community will join together in the spirit of unity and prevail over the challenges we may face. The Three Words - Advocacy, Community, and Leadership are the core foundations that SGA stands for. We strive to always advocate for our community by being servant leaders on campus. Through our decision making, SGA is dedicated to uniting our diverse community by creating an inclusive environment that emphasizes student growth.